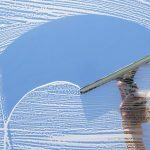 Forget about a sales pitch about the differences between professional window cleaning and the do-it-yourself approach. Chicago is home to interesting water conditions, in a weather related sense. Specifically rain water quality throughout the four seasons. A window with a screen installed throughout the year will almost certainly develop screen burn. What’s that? Screen burn is a white, cloudy look to your window often mistaken for just dirt alone. It, however, is oxidized metals from your screens mesh. Throughout the year, the cheap metal mesh on the screen, when exposed to rain water for 12 months, begins to corrode and oxidize. 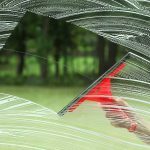 The metal is transferred from the screen to the glass and over the course of a year or so, that metal embeds itself into the glass pores, removable only with an acidic cleaner – regular cleaning procedures are not nearly effective enough. So what should you, a home owner do? Have your glass maintained at least once annually. The cost ranges from $150 to $300 for your typical home. These prices generally include screen cleaning, in addition to interior and exterior glass cleaning. Aside from this, keep most of your screens off throughout the year. Leave only a few up in the rooms that you always open windows, that way not only will you avoid glass quality issues, but your home will be aesthetically enhanced from the outside looking in. As shiny windows are far more attractive than screened windows, from the street view. Take your screens out, leave them out, and avoid screen burn. Have your glass cleaned once each year and you will be amazed how long the windows sparkle.